That, of course, leaves Russia, which shares a common form of Christianity with Greece in Orthodoxy, and which also happens to be in the middle of the most high-stakes geopolitical struggle with NATO since the end of the Cold War. “Well, we can imagine any situation, so if such [a] petition is submitted to the Russian government, we will definitely consider it, but we will take into account all the factors of our bilateral relationships between Russia and Greece, so that is all I can say. If it is submitted we will consider it,” Siluanov told CNBC in an interview in Moscow on [January 29]. While Russia is going through its own painful economic crunch, amid the dual sting of economic sanctions and declining oil prices, it is reasonable that Putin would relish the chance to buy considerable political influence within a government that’s already sympathetic to Moscow, which would certainly raise a lot of anxiety among Greece’s NATO and eurozone allies. Though the European Union nixed Russia’s planned ‘South Stream’ natural gas pipeline through Bulgaria in December, a new plan would bring gas instead through Turkey, with a terminus at the Greek border. Russia still wields significant influence with Serbia, and it has a sometimes-ally in Hungarian prime minister Viktor Orbán, making southeastern Europe an increasingly worrisome point of geopolitical focus. Though the Greek bailout formally ends on February 28, the Greek treasury won’t immediately run out of funds until later this year, which will give Tspiras more time to locate alternative sources of funding. Moves by the ECB and other actors may accelerate that timetable, however, if it pushes borrowing costs higher or facilitates more capital flight from Greece. Traditional game theory may still apply to the showdown between Greece and Europe. 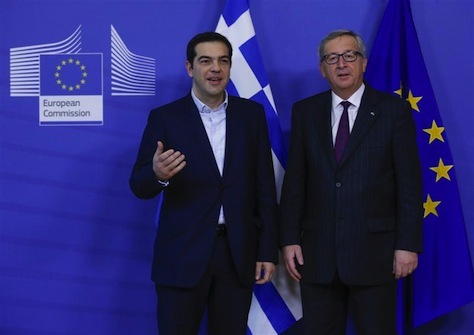 It may turn out, however, that Tsipras has planned an entirely different geopolitical game that the one for which EU leaders have been strategizing over the past three years.